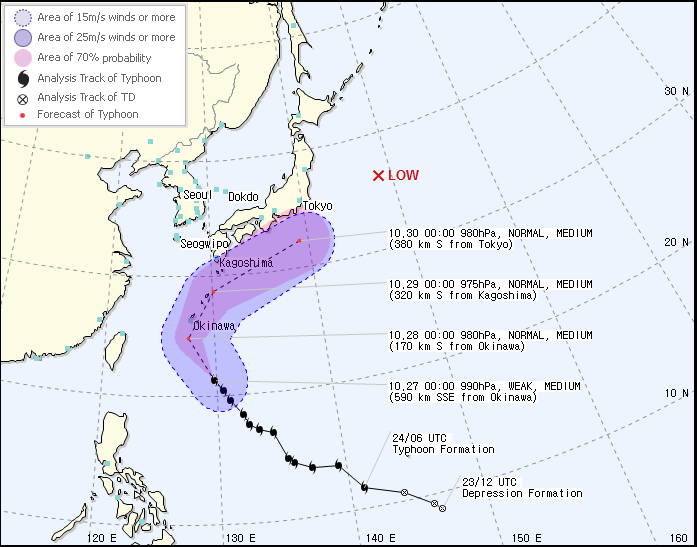 Tropical Storm ‘Saola’ is expected to bring strong winds and rain to Jeju island this weekend. Tropical Storm Saola brought gusty showers to Guam as it passed south of the island early this week and will next set its sight on Japan’s Ryukyu Islands before threatening other parts of Japan. 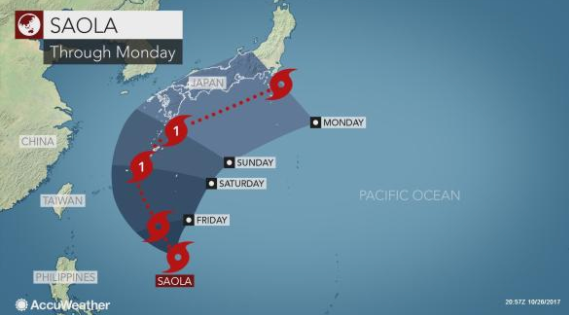 According to AccuWeather, While passing over the western Pacific Ocean, Saola will gain force and could become a typhoon as early as Friday night. Further strengthening is possible on Saturday as Saola approaches the Ryukyu Islands, Japan. Despite strengthening, Saola is not expected to be as powerful as Lan which was super typhoon with winds near 250 km/h (155 mph) last week. Tropical Storm Saloa is tracking closer to Japan and is expected to bring strong winds and rain to Jeju island this weekend although direct impacts from Saola are not expected to be as severe. According to the Korea Meteorological Agency, on the early Saturday morning, the Storm will affect the southern shore of Jeju island and would worsen all over the island on Saturday afternoon. On Sunday, rain is expected. Typhoon Saola, known in the Philippines as Typhoon Gener and in Taiwan as Typhoon Sura, was a strong tropical cyclone affecting the Philippines, Taiwan and China. Saola is the name of a rare mammal found in Vietnam.